Busy family bathrooms will be well-served by the Terma Leo MEG 600w electric towel rail. Its high output provides effective heating in areas up to 6m² and its large ladder design will acommodate a generous amount of towels. Download the Terma MEG Element Manual here. The Terma Leo MEG comes with a 5 Year Manufacturer’s Warranty on the rail, 3 Year Manufacturer’s Warranty on the chrome finish and 2 Year Manufacturer’s Warranty on the element. This item is available with free next working day delivery. Next working day delivery is available when you order before 12pm (excluding weekends). Orders of multiple items may be shipped on a pallet. If you are ordering multiple different items, we will always endeavour to dispatch your goods together. However, separate dispatches may be necessary if the items you have ordered are being shipped from different locations. Check our delivery page or speak to our customer service team for more information. Please be aware that delivery times and charges may be increased if you want the items delivered to addresses in the Scottish Highlands & Islands, or outside the UK mainland. This will be calculated when you enter your postcode at the checkout. 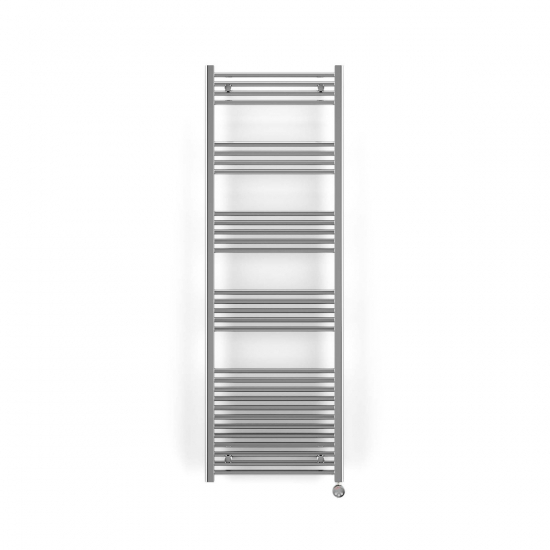 The Terma Leo MEG Thermostatic Electric Towel Rail couples a classic appearance with sophisticated functionality. Finished in glistening chrome, this adaptable bathroom heater can be used in a range of settings – from small en suites through to modern wet rooms. This is the largest Leo MEG in the range and has a 600w output for effective heating in areas up to 6m². The Terma Leo MEG is filled with heat-retentive thermal fluid that ensures your towel rail stays warmer for longer, using less energy to maintain its heat levels. Regulated by its thermostat, this versatile towel rail comes with 5 heat settings, which can be manually adjusted using the buttons on the control panel. If the temperature drops too low, an in-built frost protection feature triggers to prevent damage and ensure your towel rail continues to provide you with warm, cosy towels for years to come. The Terma Leo MEG features an IPX5 splashproof protection rating and comes with a 5 year warranty on the heater body and separate 2 year warranty on the heating element.